Get ready to see something messy. 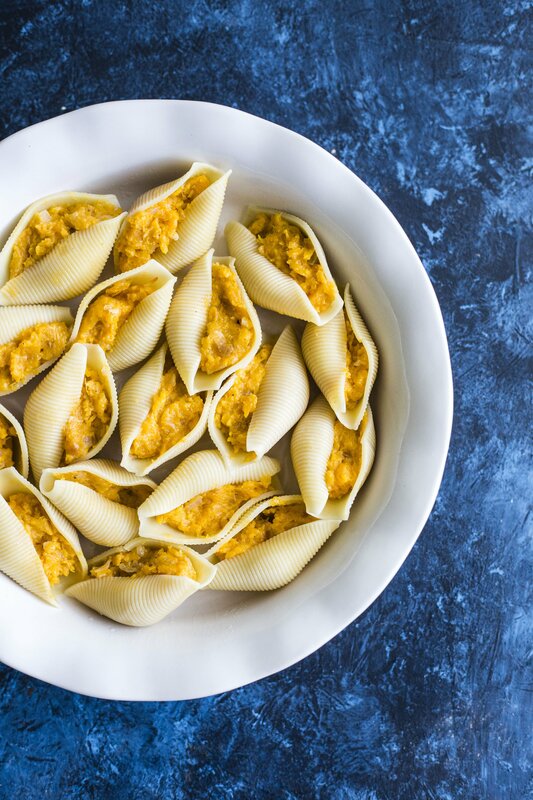 These butternut squash stuffed shells are tops. I have no idea how one is supposed to be able to photograph stuffed shells, but it seemed messier than the time I spilled two of my Wet n’ Wild nail polishes plus had an exploded lip gloss in my caboodle that housed all the string for my friendship bracelets. This was a massive problem as it inhibited me from sticking the edges of the thread into my caboodle clasp so I could make a candy stripe, then left me absolutely begging my mom to take me to Hills. Please tell me you had a Hills near you when growing up. Hills was like the… old Target. I used to coerce my mom into taking me there where I would spend hours ooogling over school supplies and the huuuuge Bonne Bell and Wet n’ Wild makeup racks. Oh my gawwwwwd. It was heaven. Then… sometimes on Friday nights… my dad would take my brothers and me there to get Coke slushies and hot dogs. Seriously… that was like the best thing ever. I have no idea what the equivalent of that would be today but I’m sure it wouldn’t be good and would be highly frowned upon. And the best part of Hills would be that every.single.time you went there would be some kid pitching an absolute FIT, screaming at the top of their lungs, running around and throwing the tantrum of the century. Probably all over some toy they weren’t allowed to buy. Total Hills tantrum. Total hilarity. I probably think that is really comical since I have yet to procreate. Right? I’ll get what’s coming to me. 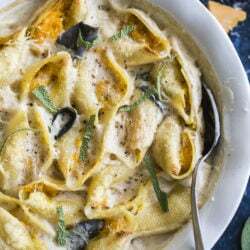 Back to this wet and wild mess of shells – it’s simply the squash mixture that I’ve become joined at the hip with since I made butternut lasagna and baked butternut penne. I cheated again, but it just feels too good. You must make. It’s sooo delicious that you’ll cry yourself to sleep. Preheat oven to 400 degrees F. Place butternut squash on a baking sheet and toss with salt, pepper, nutmeg and olive oil. Roast for 20 minutes, flip, then roast for 20 minutes more. Remove from oven and mash with a fork or potato masher until almost pureed. Boil water and prepare shells according to directions. Mine called for 9 minutes. Drain pasta and set aside to cool. While pasta is cooking, heat a small saucepan over medium heat and add 2 tablespoons butter, garlic and shallots. Whisk until brown bits appear in the butter, then mash into the butternut squash, along with the mascarpone and and tablespoon of parmesan. Spray a baking dish (8×8) or pie plate with nonstick spray. Spoon about 1 1/2-2 tablespoons (depending on the size of your shells) of squash into each shell, then lay in the dish. Repeat. To make the bechemal, heat a saucepan over medium heat and add butter. Once sizzling, whisk in flour and cook until golden and a nutty aroma appears. Add milk and parmesan and let come to a simmer while whisking constantly. Once sauce has thickened, stir in nutmeg and taste – add salt and pepper if desired. Pour mixture over top of shells, then add mozzarella and sage. Bake at 400 degrees F for 20-25 minutes, or until cheese is golden and bubbly. Have fun on this amateur night Thanksgiving Eve. ! You forgot the BEST part of Hills – the floors. They were mostly dirty white tiles but alternated strips of pink and green. The green were crocodiles and the pink were piranhas. I would spend my entire time jumping from safe shore to safe island…. And then follow it with a hot dinner of popcorn because Hills had the best popcorn. This dish was heavenly! My family loved it, even my three year old daughter. I liked it so much I included it on my weekly meal plan at RainbowDelicious.com. Thank you! I just noticed that you do not indicate how much Parmesan to put in the sauce in the ingredeint list. This screams for browned pancetta sprinkled on top. I’d probably fry my sage, in the left over pancetta grease and toast a few walnuts with it… But I AM going to make this ASAP. This is one of my “go to” recipes when trying to impress. Glowing reviews everytime. Once I served it with orange and clove (spiked with fireball) hot apple cider. Now that was complete perfection!!!! Thanks for this recipe from me and my family!!! This recipe was spot on. Came out deliciously and definitely adding it to my “special events” menus.